My poor computer had come under the weather lately and then had a case of Michelle-enduced amnesia. I spent the better part of the last two days reteaching my computer what to do, but only the necessities (eg. Word, Excel, Firefox, Photoshop). I can work on the other things later. But I thought I would share, in photos, what I’d been doing lately (when not reteaching my computer how to perform tasks). I did my sister’s nails. 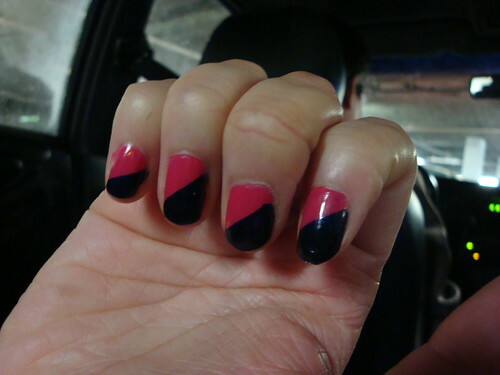 I think there’s 5-6 layers of polish (and top-coat) on each nail. Not as neat as I would have liked, but there you go. For someone who doesn’t wear nail polish on any sort of particularly frequent basis, I sure do have quite a bit of it! I also went to the thrift store with my other sister. We found a whole bunch of lovely Pyrex (she got 2 gorgeous matching mixing bowls, from Butterfly Gold 2) but some of it was chipped (or just kind of disgusting…) I ended up with a cute little one (sans lid, unfortunately) from the Verde pattern set. 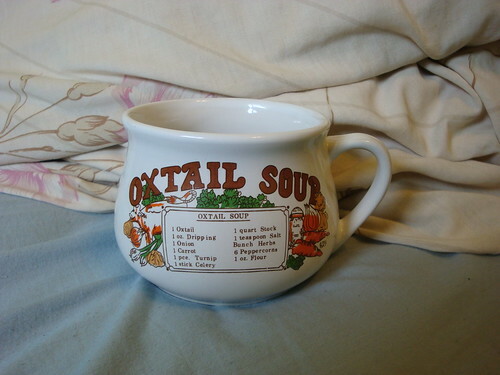 Also in my houseware finds was this fantastic soup mug! I’m really happy about this one. I started ‘collecting’ these recipe soup mugs a while ago when I first came across the mushroom and tomato soup ones, now I have 5. 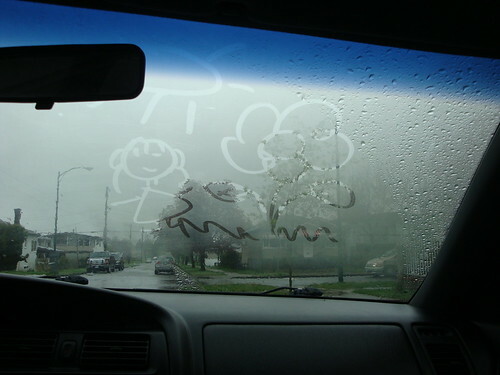 And to wrap up what I’ve been up to, my mom, one of my sisters and I doodled on the windows of the car while waiting (impatiently?). Wow, her nails look great! I love the colours. I love oxtail soup. :B I hope that recipe’s a good one!